Safford Park view from Winthrop Avenue, facing west. In 2013 the Wollaston Hill Neighborhood Association (WHNA) submitted an application for Community Preservation Act (CPA) funding for the preservation of a neighborhood park known as Safford Park. The association was awarded funding to preserve the passive nature of the park, and provide for improvements that enhance its use by the community for leisure, activities, and community assembly. With strong community input, a plan evolved and the park was renovated over the course of a two year project and was reopened to the community in the summer of 2015. Wollaston Elementary School at what is now Safford Park. Safford Park (49,236 SF) is owned and maintained by the City of Quincy, located at 166 Beale St, between Winthrop and Lincoln Avenues, gifted to the City by Nathaniel F. Safford. Located in the Wollaston Hill and Forbes Hill Neighborhoods, collectively known as Wollaston Heights, from 1873 to 1913 Safford Park served as the location of the Wollaston Elementary School until the present school replaced it diagonally across the street. On January 7th, 2013 the association submitted their proposal to the Community Preservation Committee (CPC) requesting $177,000 for a full park renovation and the construction of a presentation venue, initially contemplated as a gazebo for performance and presentations. Restoration of this neighborhood park for use in community assembly: entertainment (i.e. Arts in the Park), music performance, and leisure activities. Improvement of park for use in ceremonies and decorative lighting, such as the Annual Christmas Tree Lighting started by then Councilor Kevin Coughlin in the early years of his tenure as City Councilor. Address safety and accessibility issues resulting from broken/missing stairs and railings. Preserve the simplistic beauty and open-space look and feel. On March 14th, 2013 Walter Hubley, then Vice President of the WHNA, presented the CPA proposal to the Community Preservation Committee. The proposal was well received by the Community Preservation Committee and a recommendation for funding of $143,000 was put forth to Mayor Thomas Koch and the City Council for approval of the park renovation, less the cost of the presentation venue. Funding was approved on June 3rd, 2013 for the project and funds to be managed by the Quincy Parks and Forestry Department, in coordination with the Wollaston Hill Neighborhood Association. The Wollaston Hill Neighborhood Association, jointly with the Quincy Parks Department, worked closely with Skinner Overlook Landscape & Design to design a plan for this park preservation work. With strong community input from neighbors, landscape architect Andrew McGee evolved a plan to preserve the passive nature of the park, enhance its present day use, and highlight its existing qualities. Neighborhood association meeting, reviewing the park plans. The design process involved on-site observation of the park and its present use by the neighborhood. Special attention was paid to ensure the new design would accommodate how the park was already used by the community, while working to accomplish the goals of the project. The design process also includes a number of plan iterations and opportunities for neighbors to provide input into the plans, and express any concerns. On June 13, 2013 Walter Hubley of the WHNA and then Ward 3 Quincy City Council member Kevin Coughlin met with the Wollaston Garden Club to present preliminary plans for the park to seek the club’s input and potential participation on the project. The club provided some preliminary input to the project and were excited about potentially participating with entrance way plantings at the park, pending final design and site study. The club also presented Mr. Hubley with a scrapbook they had found in their club records containing photos and clippings from a project the club had worked on with the city on a 1962-64 beautification project their members had worked on at Safford Park with the City. 1963 Scapbook from the Wollaston Garden Club project at Safford Park. Throughout late 2013 and early 2014 preparations began for the Safford Park Preservation Project, starting with the clearing of some diseased trees and invasive species. Sandblasting and repointing of the granite retaining wall was performed. Grading of the entire park land surface was performed to help with erosion, water pooling issues, and to create a better surface for the occasional soccer practice or football game by neighborhood children. A large granite and cement monument platform in the center of the park, formerly home to a World War I monument featuring a Howitzer Cannon, was removed to further open up the center of the park for open space. Removed for metal during World War II, the Howitzer was never replaced, leaving an empty platform for many years. The old broken and weathered stairs and walkways were replaced. A stone structure at the upper landing of the bottom stairs was constructed to provide for a stage for presentation use at the park. Installation of electrical facilities to illuminate the granite retaining wall, christmas lights on Clara’s’ tree - planted by former Councilor Kevin Coughlin in memory of Clara Yoemans, a long-time neighbor and community activist. The electrical facilities also power electrical outlets to provide power for a number of applications at the park, including PA systems for music and performance. Shrubs were planted atop the granite retaining wall and along bordering properties, to include Mountain Laurel and Winter Berry. The entire surface of the park was seeded for new grass in the fall of 2014. Five beautiful new trees were planted to provide a blend of seasonal colors and a next generation of shade cover for future generations. New trees include Red Maple, American Elm “Valley Forge,” and Bi-color Oak. 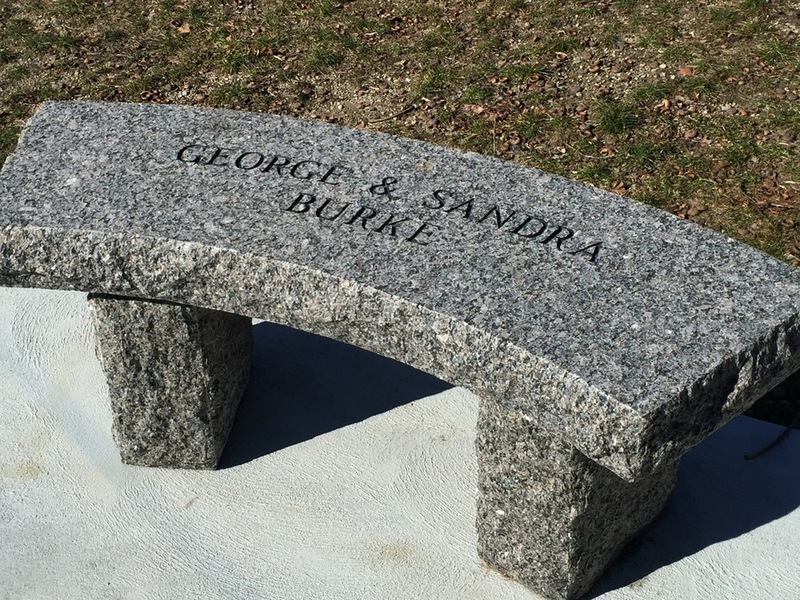 Four beautiful rustic stone-faced granite benches were donate by long-time neighbors George and Sandra Burke, Councilor Kevin Coughlin and Family, the Hubley Family, and the Meade Family. Two of the granite benches were placed on the stair landing, to provide for seating overlooking the park, and two of the benches were placed in shady areas along the two paths. 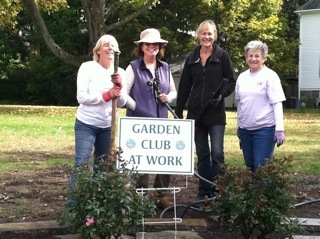 The Wollaston Garden Club took on the important task of beautifying the North West corner of the park over the course of 2015. Civic Beautification Chairs Jo Costello, Ann Foresman and Kathleen Ceurvels lead the effort at Safford Park, and members Carol Fischer, Ruth Griffin, and others from the club assisting. After a study of the area and design work, the club repurposed some unused granite blocks to frame in a multi seasonal garden area at the corner of the park. 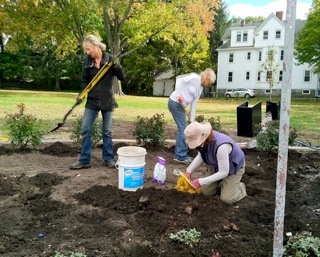 The Park and Forestry Department leveled the location, placed the granite blocks in place, and delivered the compost to the location at the location and the Wollaston Garden Club began their work. Pink Knockout Ross line the back row, and ground cover was planted in the front corner. Grasses will be planed in the middle in the spring of 2016 as the cold weather subsides. Water facilities were installed for garden irrigation. 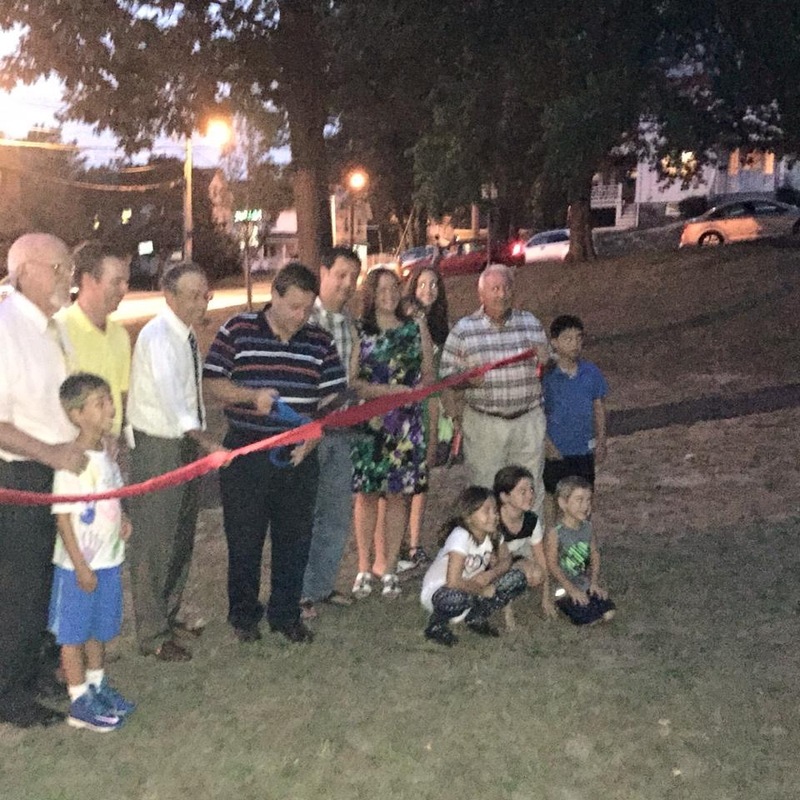 Safford Park was reopened on August 31st, 2015 with a ribbon cutting ceremony and a family movie night at the park. Neighbors attended to celebrate the park’s reopening to the neighborhood. 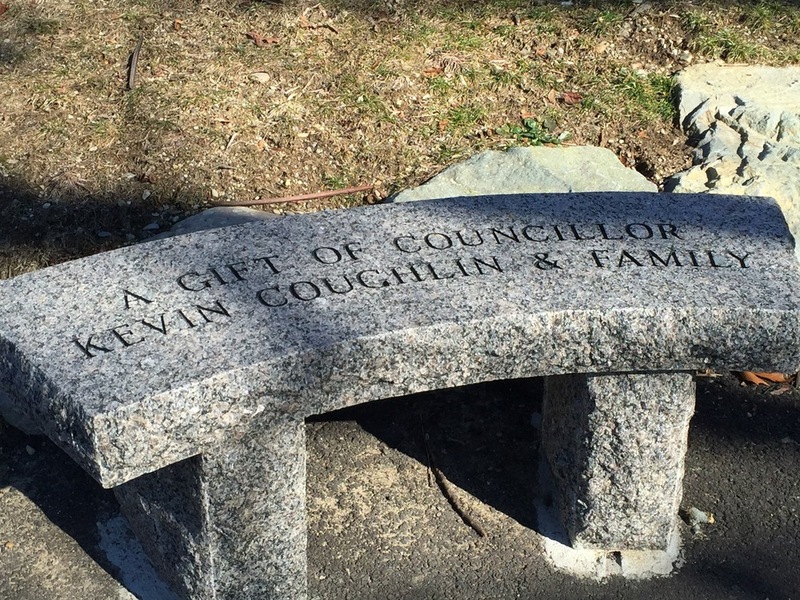 Mayor Thomas Koch praised the project as a community effort, including members of the Wollaston Hill Neighborhood Association and the City’s Park and Forestry Department, with contributions from the Wollaston Garden Club.